Fashion With A Conscience has moved. Visit www.fashionwithaconscience.org: MOvember looks we loved! 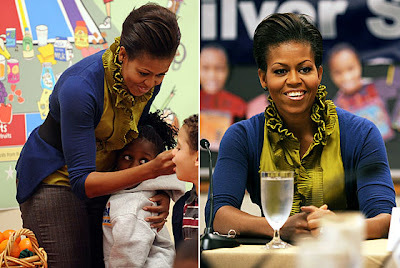 Mrs. O is looking better then ever these days. Here are some of her best November looks. 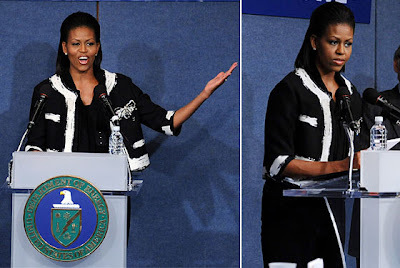 On November 5th, at the National Science Bowl at the Department of Energy in Washington, DC, Michelle wore this black and white jacket by Moschino. Photo: Getty Images. On November 18th, Michelle opted for a J. Crew ruffled blouse to visit Hollin Meadows Elementary School in Alexandria, Virginia. Photo: Getty Images. This Moschino dress is to die for. Mrs. O-so-chic was all smiles at the presentation of Robert F. Kennedy human rights award to Malangu at the White House in Washington, DC on November 23rd. Quite frankly we would be all smiles too if we were wearing this dress , no matter what! Photo: AP. And for the finale! On November 24th, the first couple hosted the first official State Dinner. Michelle looked radiant in a silver sequined gown (the sequins were strategically placed) by Naeem Khan. Photo: Getty Images. Love, Kelie.